Are you suffering from gambling addiction? Or it can be someone you know. It could be someone in the family. It doesn’t matter. 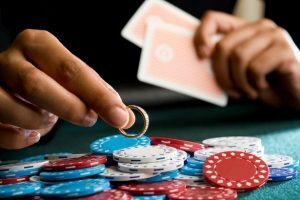 If someone that’s a part of your life is suffering from gambling addiction, chances are you are going to get involved. Gambling is a mental health problem that needs to be taken care of, or it can cause a lot of trouble. Addiction is the act of not being able to stop doing something even though we know it would cause harm.It could be in any form such as gambling, drugs, alcohol, cigarette, or anything that consumes our time, money, health, and wellbeing. So if you or someone you know are suffering from an addiction, you have the responsibility to save yourself and save all the people around you. You try to quit, but you just can’t. No matter how you know it’s affecting you negatively, you just can’t stop. There’s always the urge to gamble. It’s like a craving that can’t be satisfied until you get it. You bet with an amount more than you have. You are not afraid of losing a significant amount of money because your addiction is more powerful than your fear. You borrow money just to support your addiction. You lie, and you make up reasons to get money from people close to you like your family. You get serious instead of having fun. Losing makes you upset, and it makes you want to gamble even more. You have mood swings, especially when you think about gambling which is every moment of every day. It’s as if your life is revolving around it. 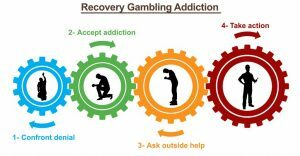 Acknowledge that you are suffering from gambling addiction. It is the most critical step in fighting this problem. It means you are ready to reclaim your life back. Confide in the people you trust. Ask help from your family and friends. They are the people who have a genuine concern for you. Find a new interest in sports, music, or arts. Find an activity that can encourage self-achievement and self-worth. Try your very best to avoid gambling again. If it crosses your mind, think of something else. Make yourself busy with important matters like your job. Seek professional advice. Some people and agencies can help you with your battle against gambling addiction. You are not the only one suffering from this problem that’s why many people devote their time trying to save families and lives. Gambling plays with our emotions, so it could only mean that it is controlling you emotionally and mentally. It can cause you everything you have worked for including your house, car, properties, job, health, and family. To sum it all up, you could lose everything. So there’s no winning in gambling, especially when you’re addicted to it.Be wise, stop!Don’t bet away your life and everyone else’s.